(Nanowerk News) With fears growing over chemical and biological weapons falling into the wrong hands, scientists are developing microrockets to fight back against these dangerous agents, should the need arise. 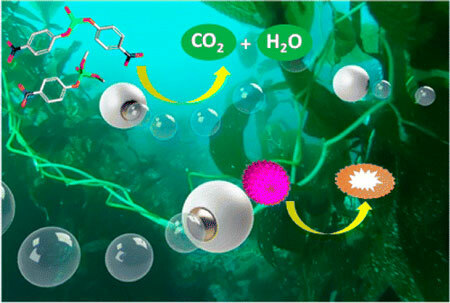 In the journal ACS Nano ("Water-Driven Micromotors for Rapid Photocatalytic Degradation of Biological and Chemical Warfare Agents"), they describe new spherical micromotors that rapidly neutralize chemical and biological agents and use water as fuel. Joseph Wang and colleagues point out that titanium dioxide is one of the most promising materials available for degrading chemical and biological warfare agents. It doesn’t require harsh chemicals or result in toxic by-products. Current approaches using titanium dioxide, however, require that it be mixed in whatever solution that needs to be decontaminated. But there’s no way to actively mix titanium dioxide in waterways if chemical and biological agents are released into the environment. So scientists have been working on ways to propel titanium dioxide around to accelerate the decontamination process without the need for active stirring. But approaches so far have required fuel and other compounds that hinder neutralization. Wang’s team wanted to fix this problem. To give titanium dioxide a source of thrust, the researchers coated it over a magnesium sphere core. When put in a watery environment, a single hole in the shell allows water to enter and react with the magnesium core. This produces hydrogen gas, which bubbles out and propels the titanium dioxide through the surrounding liquid. This enables it to more efficiently and rapidly contact and degrade harmful agents. When tested, the micromotors successfully neutralized nerve agents and anthrax-like bacteria in considerably less time compared to titanium dioxide microparticles that aren’t propelled.